We sell and services the most durable, dependable chains on the market. 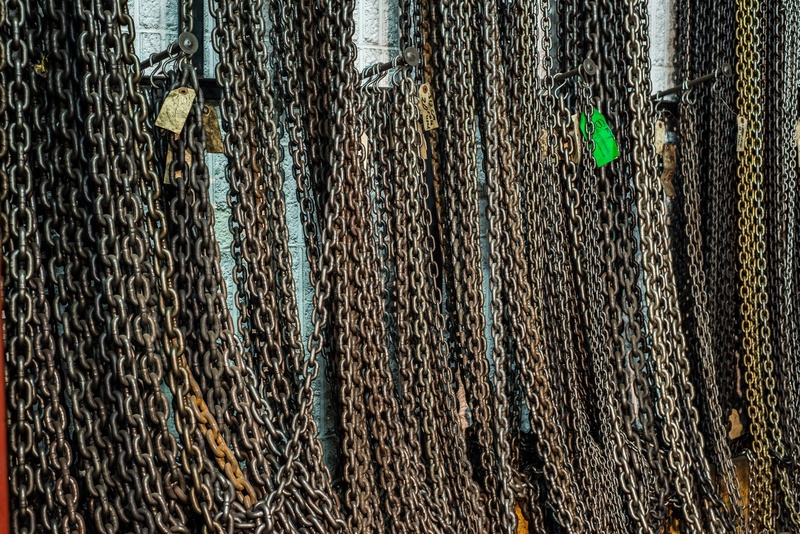 Our chains are grade 80 or grade 100 lifting grade chains, ideal for lifting high-temperature or difficult loads. Chain slings withstand oil, grease and resist many chemicals, including most bleaching agents and acids. Over time, however, chemically active environments (liquids, solids, vapors or fumes) can corrode lifting chains and degrade strength. Temperatures above 400° F (205° C) reduce the load ratings for alloy chain slings. If your chain slings will be exposed to temperatures below minus 40° F (minus 40° C), contact us for guidance. If your chain slings are exposed to temperatures above 1000° F (538° C), retire them from use. Ensure that the fitting is the correct shape and size so it properly seats in the hook or lifting device. For multiple-leg slings used with nonsymmetrical loads, have a qualified person do an analysis so you don’t overload any leg. Select multiple-leg slings according to OSHA guidelines for alloy chain slings. OOSHA rates loads based on material strength, design factor, type of hitch, angle of loading, diameter of curvature over which the sling is used and fabrication efficiency. Never exceed the working load limit and avoid shock loads. Refer to OSHA guidelines for alloy chain sling rated loads. Do not use chain slings with loads above the rated load capacities on the tag. Store slings away from potential kinking, mechanical or corrosive damage, moisture and extreme temperatures. Properly hitch slings, pad sharp edges, balance loads, don’t drag slings, keep them free of kinks and don’t pull a sling from under a load when the load is on the sling. Inspect slings daily and according to OSHA-approved ASME guidelines. Have each person who will use your chain sling know and follow its type of load, hitch and rated load capacity. Contact us for clarification. Follow other safe operation procedures, including selecting the right sling, keeping people safe distances away from the sling and its load during movement, properly rigging loads and inspecting all slings daily and according to OSHA-approved ASME guidelines. Do not use worn or damaged slings or attachments. Discard or refurbish them. Use damaged slings only after they are reconditioned, and proof tested by the sling manufacturer or a qualified person. Keep certificates of proof test. You may also use Olsen Chain & Cable’s lifting equipment inspection services.